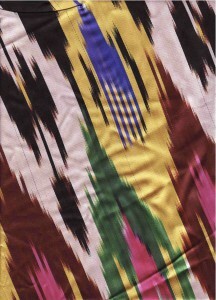 Ikat Silk is a weaving of common threads individually dyed. As they are woven together a unique pattern of beauty reveals it’s self; The making of Ikat quickly traversed the Silk Road growing as multiple ethnic groups became involved in the production process by adding bits of their own unique cultural expression. The evolution of belly dance in the past 50 years has been like Ikat. It began to take root in the late 60’s as hobby for American women. Since then, it has spread world wide. Women in Canada, South America, Australia, Russia, South Africa, Finland, China and everywhere . We are all belly dancing these days. They all have added their distinct signature to this dance that by nature is ancient, uniquely feminine and unites our common bonds as women. Each culture has taken the base material and techniques and made it their own. Getting involved in belly dance also opened our interests to each others cultural folk dances done by our sisters. A natural course of cultural exchange. All dance is influenced by politics, life style, music, technoledgy, environment and the culture surrounding it, thus when dances arrive on new soil they begin to change. A second natural influence that will shape our dance collage is the venue of doing any of these dances in a parade. After 20 years of belly dancing in the Fremont Solstice Parade, we have evolved a new style of belly dance that adapts to the venue. Many movements are abbreviated for the demands of the constant traveling forward and the hard asphalt. The same will evolve for the other dance styles we will employ. Our ensemble celebrates the common threads of life, women, the belly, birth, creativity and dance. This year our chosen theme brings a multi cultural experience onto the streets of Fremont USA. American dancers add their creativity and influence to an ancient tradition by weaving our bodies through dance, colorizing by way of costuming, and expressing our selves and celebrating through common threads. We hope to create a wild and colorful mix. As colorful and as wild as ikat! PLUS this will be the first year we have used amplified music in addition to our famous drum core. It will give nice contrasts to all our the changes.